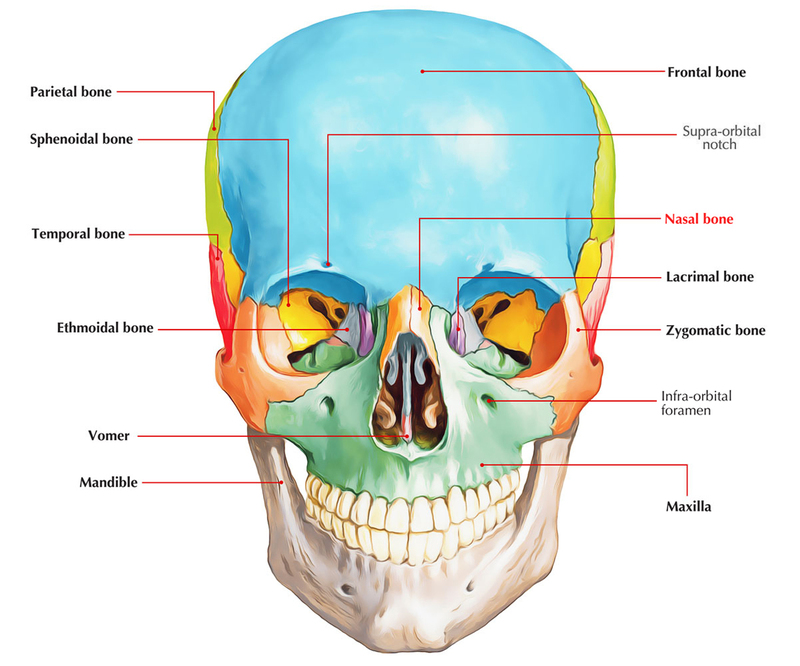 Each one of the nasal bone has four bones, which create joints: two cranium as well as two facial bones. The cranium bones: the ethmoid and frontal. The facial bones: the maxilla and opposite nasal. Each nasal bone has four borders: the superior, inferior, lateral, and medial. Each nasal bone has two surfaces: the outer and the inner. Superiorly, in the nasal section the paired nasal bones merge in the midline with each other and with the frontal bone superiorly. The center of the frontonasal suture is created through the combination of the nasal bones and the frontal bone is the nasion. All nasal bones and the frontal processes of all maxilla articulate with each other laterally. Piriform aperture is the large opening located inferiorly within the nasal region and the anterior aperture of the nasal cavity. The nasal bones bounded it superiorly and with each maxilla laterally and inferiorly. Creating the lower part of the bony nasal septum and terminating anteriorly as the anterior nasal spine and the paired inferior nasal conchae, the fused nasal crests are detectable via the piriform aperture. Covered with the compressor naris and the procerus muscles. Convex shaped from one side to the other and concavo-convex from the top to bottom. 2. The inner surface of the nasal bone travels downward and has a groove that attaches one of the branches of the nasociliary nerve. This surface is concave in shape from one side to the other. 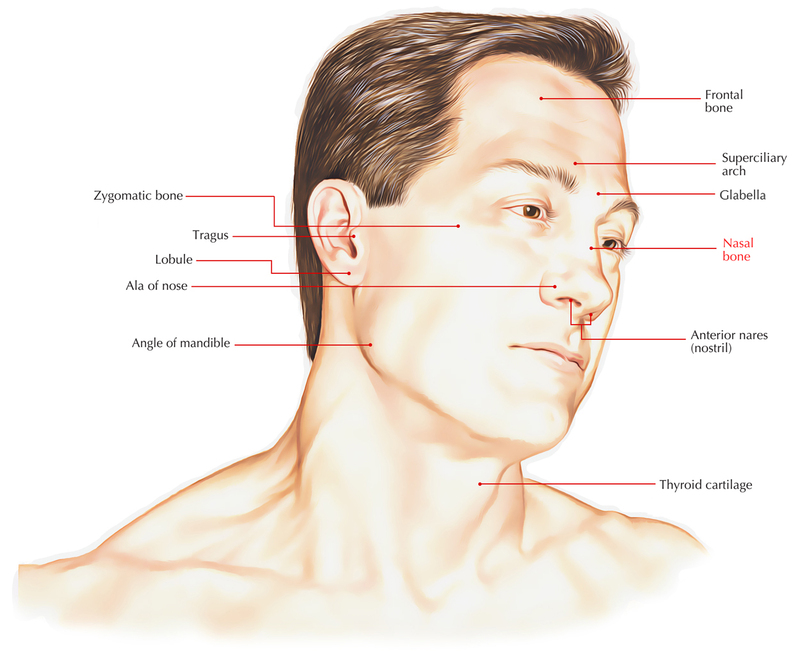 Nasal bone fractures are the most frequently occurring variety of facial fractures, it makes approx. 45% of facial fractures, and whenever major facial swelling is found, they are likely to get overlooked. Nasal bone fractures arise when the nose impacts against a solid object. Lateral impact injuries are the most frequent type of nasal injury leading to fracture. Nasal-bone fractures when isolated are most commonly a displaced fracture of one the paired nasal bones. An absent nasal bone is a feature which can sometimes be used as an adjunctive marker in fetal sonographic assessment for fetal aneuploidy. It is evaluated on a midline sagittal view. The nasal bone is frequently seen in this section as a bright echogenic line. It is best visualized near 1st trimester i.e. 11th to 14th weeks of gestation. A magnified image may assist in visualization. A follow up scan after a week is advised when the other ultrasound markers and serum biochemistry are normal, but the nasal bone is absent at 11 to 12 weeks. In fetuses of Afro-Caribbean parents. Hypoplasia of the nasal bone is a sonographic examination, in which the fetal nasal bone seems smaller by altering degrees. Nasal bone hypoplasia has a spectrum in which the comparatively easily recognized absent nasal bone is at one point. Other point of the spectrum is harder to describe, mostly whenever used as a screening device. Compared to 45-63% of fetuses with Down syndrome nearly 0.6-1.4% of normal fetuses are assumed to have a hypoplastic nasal bone on a routine 2nd trimester scan. Down syndrome: nasal bone hypoplasia has emerged as one of the strongest morphological markers of trisomy. Until now it is associated to the morphological observation that individuals with Down syndrome have short noses. Fetal warfarin syndrome is a rare relation.